Today I want to talk about one of the most important macro themes we’re currently tracking. And then discuss some of the amazing asymmetric trade opportunities which dovetail off this secular story. But, first, this. Mauboussin wrote the following about S-curves in his book More Than You Know (emphasis mine). There is substantial evidence that industry sales and earnings trace an S-curve after a discontinuity or technological change. Growth starts slowly, then increases at an increasing pace, and finally flattens out. This diagram is useful for thinking about shifting expectations. Investors (indeed humans in general) often think linearly. So at point A, investors do not fully anticipate the growth and economic returns from an industry, and they extrapolate the growth and economic returns from an industry, and they extrapolate relatively low growth. Expectations for future financial performance are too low. Following a period of sustained growth (point B), investors naively extrapolate the recent growth into the indefinite future. Expectations are too high. Finally, at point C, investors reign in expectations and adjust stock prices to reflect a more realistic outlook. Humans are bad at many things. Thinking in non-linear terms is one of them. Things like exponential growth and the incredible power of long-term compounding are tough for us to wrap our little monkey brains around. This is one of the many reasons why we’re naturally bad investors. The ability to think in exponential terms and understand how to harness the power of compounding are a few of the traits that make the greats, well… great. Lucky for us, we can all learn to think in these terms and utilize these frameworks with enough practice. Adding the S-curve model to one’s tool-kit, certainly helps. The power of the S-curve isn’t limited to only industries and products. It’s also relevant to countries and whole economies, as well. If you study the history of how economies grow along their maturation cycle. How they move from frontier to emerging, and finally to developed economy status. 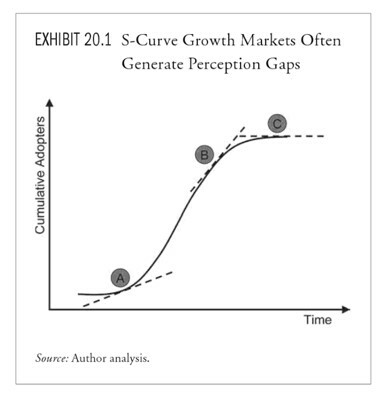 You find that the growth is not linear but follows an S-curve pattern similar to the chart above. This is something we wrote about in our October Market Intelligence Report (MIR) which we titled The Curve of Destiny (cheesy, I know). Here’s a section from that report. Tracking the progression of what we call the “wealth S-curve” is an important part of the current framework we’re using to gauge and assess the developing state of global macro affairs. We think its impact over the next two decades is going to be, well, exponential. So, a lot larger than what anybody is figuring right now. When a country’s gdp-per-capita crosses the “tipping point” on the wealth S-curve (this is in the range of $2,300-3,300 USD). Not only do the consumption habits of its citizens drastically change. Transitioning from simple low input goods to higher value/input goods. But the aggregate amount of what they consume begins to increase exponentially. Between 1970 to 2000, the average number of people in the world hitting th S-curve simultaneously was fairly stable at around 700M. In the early 2000s this began to change. More people around the world began passing the S-curve tipping point. This was initially led by China, but is now also being driven by India and other Asian countries. According to current calculations, we’re about to see approximately 4 billion people around the world go through the knee of the curve at the same time. …in two to three years there might be a tipping point where the majority of the world’s population, for the first time ever, will live in middle-class or rich households. The rate of increase of the middle class, in absolute numbers, is approaching its all-time peak. By 2030, global middle-class consumption could be $29 trillion more than in 2015. Only $1 trillion of that will come from more spending in advanced economies. Today’s lower middle-income countries, including India, Indonesia, and Vietnam, will have middle-class markets that are $15 trillion bigger than today. We are witnessing the most rapid expansion of the middle class, at a global level, that the world has ever seen. The vast majority— almost 90 percent—of the next billion entrants into the global middle class will be in Asia: 380 million Indians, 350 million Chinese, and 210 million other Asians. 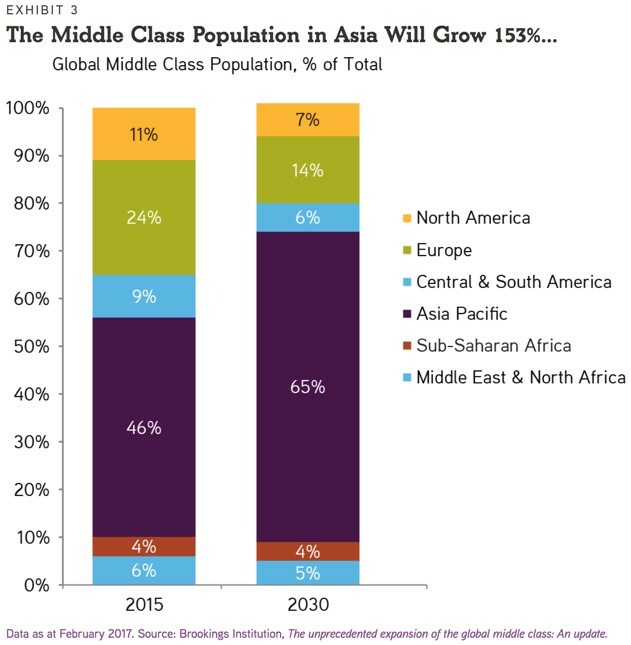 Over the coming decade, the middle class in Asia is going to grow by 153%. 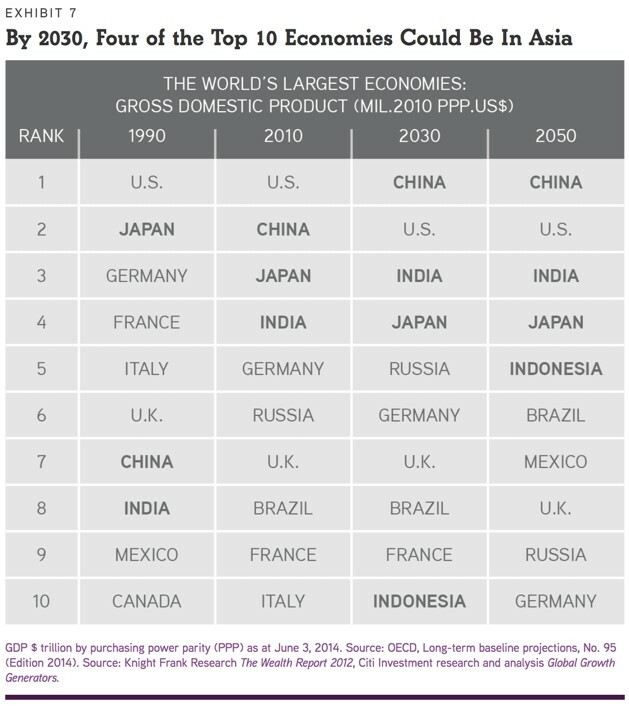 In 12-years time, four of the world’s top 10 economies will be in Asia. 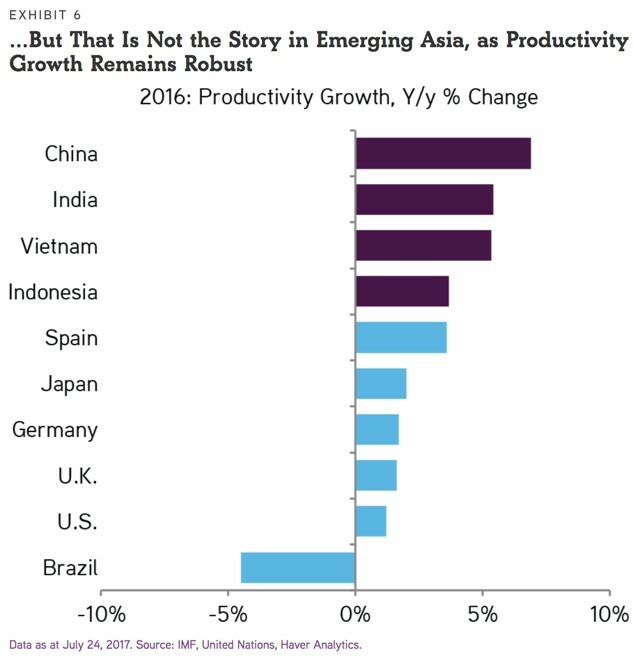 The majority of this growth is going to come from the two behemoths of Asia, China and India. China crossed the wealth S-curve tipping point back in the early 2000s and is about half-way through the ‘knee of the curve’. This is what drove much of the early 2000’s commodity and emerging market boom. I know, stupid question, of course we would. And no we haven’t invented a time machine. But… lucky for us we don’t need one. Because, India is giving us nearly the exact same opportunity. We know that exponential growth is coming to one of the largest countries by population in the world. This country is surrounded by other countries whom also have either crossed the tipping point, or are about to. And these countries trade and do business with one another. Do you see the potential for a massive flywheel of economic growth here?! Take a look at the following charts via commodity fund, Goehring & Rozencwajg. 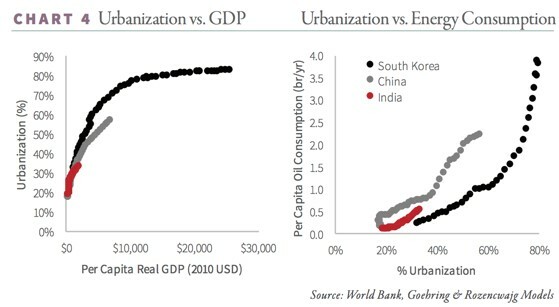 In the 1960s, South Korea was one of the poorest countries in the world. Now it’s the 12th largest, on a GDP basis. South Korea crossed its tipping point in the early 1980s. It then experienced rapid growth over the following two decades. 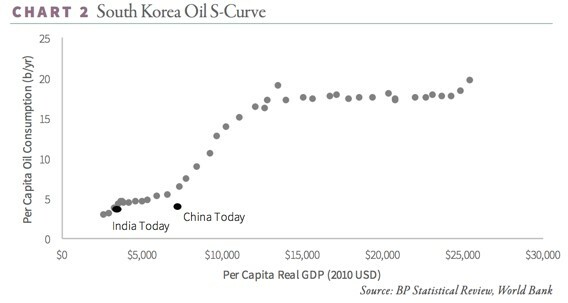 China is where South Korea was along the wealth S-curve in the very early 90s. India matches South Korea at the start of the 80s. Both are following a similar pattern. And both have populations that are many multiples the size of Korea’s. Are you starting to get a sense for how big this opportunity is? Now, is the market pricing any of this in? The market thinks in linear terms, remember… it extrapolates the recent past and projects it far into the future. The kind of exponential growth we’re talking about is nearly impossible for the average market participant to imagine. The market’s limitations though, is our advantage. Because we’re aware of this powerful developing macro trend, we get the ability to essentially travel back in time and pick the Indian equivalents of the Tencents, the Baidus, and Ctrips. I’ve been digging into this market and have found a handful of “coffee can” stocks. These are the kinds of companies that have a trifecta of secular growth winds at their backs. They’re in fast growing industries, in expanding markets, and in secular high growth countries. The runway for these companies is so long that you just want to buy the stock and stuff it away into a coffee can and forget about it for next 10-years. We’re going to be covering these stocks and the secular rise of Asia in February’s Macro Intelligence Report (MIR). I’m excited to share what I’ve found with you. I think some of these names have 10x+ potential over the next five years. And that’s not an exaggeration. Click Here To Learn More About The MIR! There’s no risk to check it out. We have a 60-day money-back guarantee. If you don’t like what you see, and aren’t able to find good trades from it, then just shoot us an email and we’ll return your money right away. 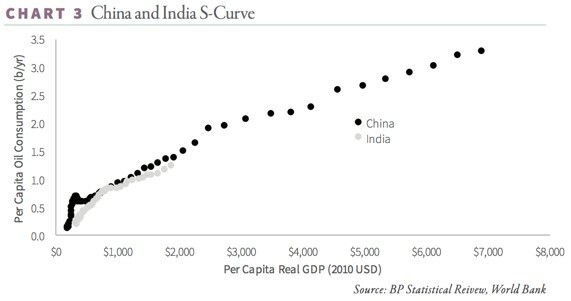 Like I said, the Asian S-Curve could be the defining investment theme of our careers. Don’t miss your chance to take advantage.